Lopesan Villa del Conde Resort and Thalasso is the only hotel of its kind in Gran Canaria, because of its unique design. Enjoy the comfort of its luxurious facilities in the authentic enchanting setting of a village of the Canary Islands, with its parks, square and stately homes with hanging wooden balconies in traditional Canarian style. A holiday full of luxury, entertainment and sprinkled with an exotic touch is now possible at Lopesan Baobab Resort. This exclusive Gran Canaria resort is one of the most original, striking and spectacular hotel complexes on the island. The Lopesan Costa Meloneras Resort Spa & Casino is a magical place in Meloneras, the most exclusive tourist area in Gran Canaria. The Maspalomas Dunes Nature Reserve's desert landscape provides a unique backdrop where you can daydream and relax whilst talking long walks along the beach. This impressive resort represents a Canarian village and consists of 9 different buildings, but without the feeling of being in a large resort. Guests have the opportunity to make use of the huge, 10,000m² sub-tropical garden area. 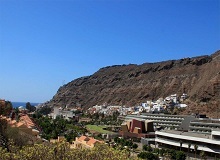 Gran Canaria is the second most populous island of the Canary Islands and is west of the southern coast of Morocco. The hotel is a short distance from the coast and beachfront and offers easy access to the GC-1 motorway and is about 35 minutes by car to the Gran Canaria Airport (LPA). Popular with families and couples looking for a fun filled time at the Paradise Resort Taurito and Waterpark this hotel offers comfortable rooms and great views of the resort below. The hotel is surrounded by large gardens and only 200m from the beach, local shops, bars and restaurants. Popular with families and couples looking for a fun filled time at the Paradise Resort Taurito and Waterpark this hotel offers comfortable rooms right on the doorstep of the water park and other resort facilities. The hotel is only 50m from the beach, local shops, bars and restaurants. 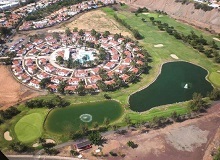 The Cordial Mogan Valle Apartments, built in 2008, are located in the beautiful resort of Puerto Mogan, known as Little Venice in Gran Canaria, close to the chic marina and the beach. The apartments are all decorated in a modern fashion complete with state of the art facilities. Playa del Ingles - 4 Star. The Corallium Dunamar Adults Only hotel offers wonderful panoramic views over the sea from its elevated position on the south coast of Gran Canaria. Sheer paradise with a tropical climate all year round, set among lush gardens. 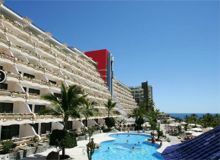 The Occidental Margaritas hotel is located on Playa del Inglés, one of the most popular tourist resorts in the south of the island of Gran Canaria. A modern design hotel, where open spaces, minimalist decoration and light-filled areas stand out, creating the perfect mix of modern and innovation. Its modern facilities, pleasant atmosphere and excellent service from the highly qualified staff will ensure you have an enjoyable stay. The Vital Suites Residence, Health & Spa is a modern and luxurious 4-star hotel in the quieter area of Playa del Ingles with unbeatable views of the dunes, the lighthouse, and the nearby golf course of Maspalomas. Apart-Hotel Green Field is a harmonic and modern complex located in the heart of Playa del Ingles, four hundred metres away from the beach, and close to a vast selection of shops, lively bars and restaurants, discos and cabarets. Playa del Ingles - 3 Star. 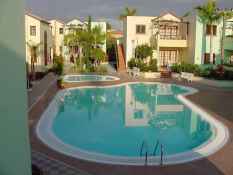 Found excellently situated in a lively zone very close to the centre of Playa del Ingles. Extremely well equipped with many facilities, the hotel offers all that is needed to enjoy full and comfortable entertainment holidays in an extraordinary environment. A comfortable hotel with a good range of amenities, the apartments are bright and well appointed with all of the modern amenities required for a comfortable stay and ideal for a family break.